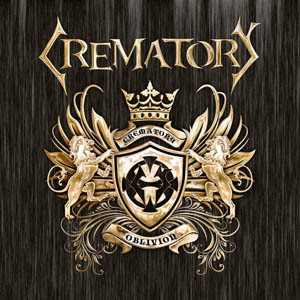 Like all great rock bands, CREMATORY have based their success on the creativity of a well-rehearsed songwriting team. With Germany's leading gothic metal act, it's drummer Markus Jüllich in collaboration with the producer of each individual album that's kept the group's compositions on course for more than 25 years. At the same time, Markus Jüllich has enough experience to know that the band's evolvement depends on fresh ideas and new influences. So, by enlisting guitarists Tosse Basler and Rolf Munkes and, soon after, bassist Jason Mathias, he has ensured that the band has remained contemporary and diverse ever since their 2016 release Monument, reaping the fruits his efforts on the new album Oblivion. "In particular, the sound and the selection of songs reflect the impact our three new band members have had," comments Markus Jüllich. "Tosse is a fantastic rhythm guitarist who adds even more diversity to the material with his clean vocals, and our lead guitarist Rolf enhances the record with his solos. Jason has added lots of drive to the deep frequencies, which is why we've consciously opted for a loud mix of the bass parts." Along with his wife Katrin (keyboards & samples) and vocalist Felix Stass, the three new additions are important factors that ensure that CREMATORY find themselves in a contemporary and forward-looking position in 2018. In fact, the band went one step further on Oblivion: while Markus Jüllich and producer Kristian Bonifer were busy working on the basics of their new recording at the Kohlekellerstudio, Stefan Glass, Dirk Riegner and Walter Stobbe were asked to contribute additional input to the creative process. "Dirk comes from the indie genre and helped to add an important new nuance to the characteristic CREMATORY approach," Markus Jüllich explains. "Stefan Glass is a specialist for orchestral arrangements and Walter Stobbe is a real riff virtuoso on the guitar." The result is thoroughly compelling as well as ingenious. CREMATORY's unmistakable style manifests itself on programmatic numbers such as "Ghost Of The Past" and "Revenge Is Mine", but also on the anthemnic "Wrong Side" and the melancholy title track. The Stefan Glass-inspired orchestral arrangements can be heard on the dark opener "Salvation" as well as on "Until The Dawn", "Blessed" and "For All Of Us". Walter Stobbe's penchant for heavy metal features on "Cemetary Stillness" and on the album's impressive finale "Demon Inside". CREMATORY have rarely sounded as multi-faceted and timeless as on Oblivion. The group's classic trademarks, such as Felix Stass's deep growls, are still present, at the same time new influences emphasise their great commercial potential. Markus Jüllich: "So far we've had a special motto to set the direction of each of our albums, but Oblivion simply combines all our strengths and experience. Over the years we've learned to blend different styles into the typical CREMATORY sound without ever losing sight of the importance of playing in a way that benefits our music. The motto "less is more" applies to our compositions 100 per cent. CREMATORY songs never lose themselves in exaggerated effects but always go the whole hog. That's partly due to the fact that we've remained very much down-to-earth." Which is exactly what CREMATORY's countless fans will be able to witness when the band embark on their 15-show tour of Germany at the end of April 2018. As Markus Jüllich aptly puts it: "Even if we know exactly what matters when you tour, we want to learn something new with every new concert." The new album Oblivion will be released through Steamhammer/SPV on April 13th 2018 as CD digipak (incl. poster), 2LP gatefold (golden vinyl), download and stream.